I’m going to let you in on a little secret. Once in a while when you see “X revolutionizes our understanding of Y” in the science section of the news, it can be a teensy bit overstated. Because the fossil record for haramiyids is fairly scanty, it’s not well understood whether haramiyids were actual mammals, possibly ancestral to multituberculates, a group of evolutionarily successful rodents. You’ll remember from high school biology class that all modern mammals are a) vertebrates, b) warm-blooded, c) give birth to live young (except for weirdo monotremes like platypus and echidnas who lay eggs), d) have hair/fur, e) feed their offspring milk, and (obviously) survived the Cretaceous-Paleogene extinction event about 66 million years ago which wiped out all the dinosaurs (except birds). What you might not know is that there’s been a lot of debate as to how and when mammals diversified into their many different forms (a process evolutionary biologists call adaptive radiation), leading to over 5,400 species existing today. Our understanding isn’t helped by a poorly preserved fossil record. We know for sure that mammals were present by the Jurassic, but early mammaliaform fossils (like the haramiyids) are difficult to identify as mammals for certain. Where did I come from??? If we had a much better idea of when mammals originated, it would help us better work out details of their evolution. The majority of fossil-based analyses favor a more recent origin of mammals, while many molecular-based analyses (relying upon the molecular clock) place the origins of mammal orders much earlier. There are some drawbacks to each approach. For example, with the fossil-based analysis, we have to deal with the fact that some features evolved multiple times (a phenomenon called homoplasy), which can muddle our understanding of which species are ancestral to others. And with the molecular-based approach, we have to make assumptions that genes evolve in a “clock-like” fashion; that is, the rate of DNA mutation is constant and predictable. 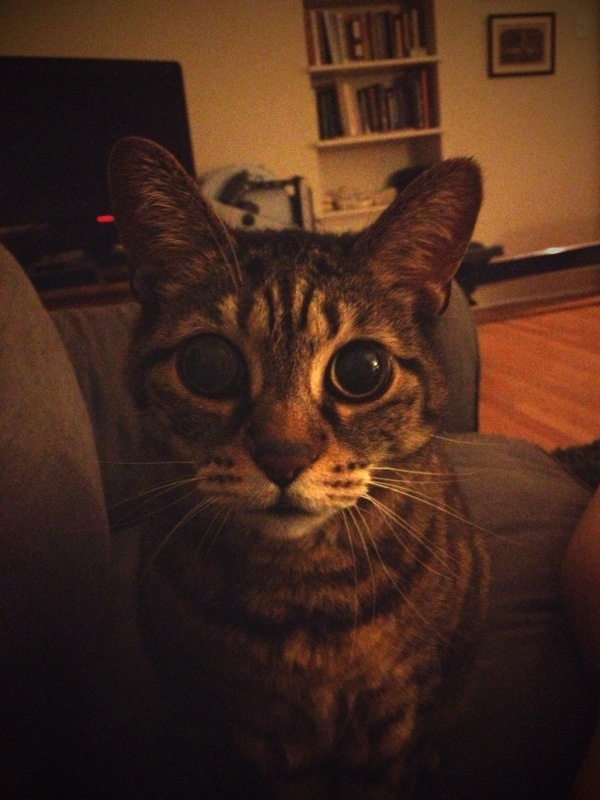 (There are various ways to deal with this, but that’s a subject for another post). In order to reconstruct the true story of mammalian evolution (and despite what creationists say, the past can be studied without personal observation), the fossil and molecular data should be in concordance. That means that we need both better early mammalian fossils, and good models for mammalian genome evolution. So that’s where these two new fossils enter the picture. They’re fairly well preserved, and an analysis of their features ought to shed light on whether haramiyids are mammals or not (and therefore when mammals originated). Both date to between 160-165 million years ago. 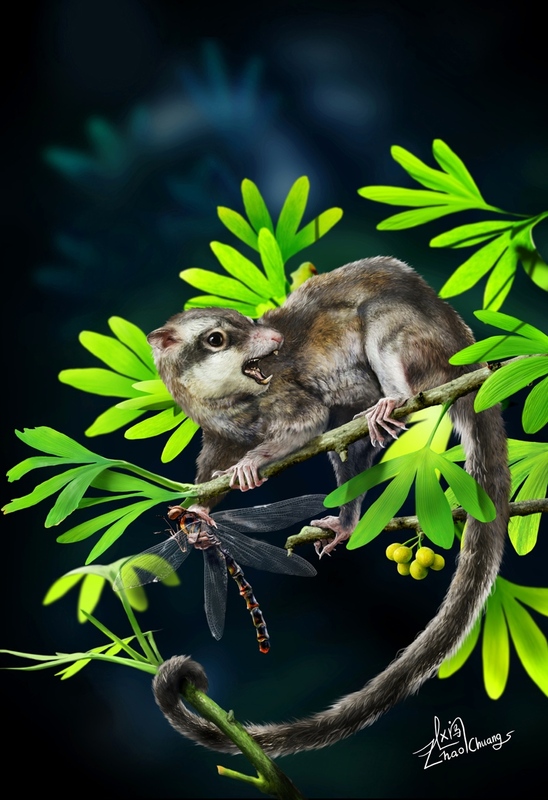 The first fossil, Arboroharamiya, was likely a tree-dwelling mammal (with a possible prehensile tail!) described by Zheng et al. Their analysis of its skeletal features groups it (and haramiyids) with mammals, implying that mammals originated during the Late Triassic (more than 200 million years ago). 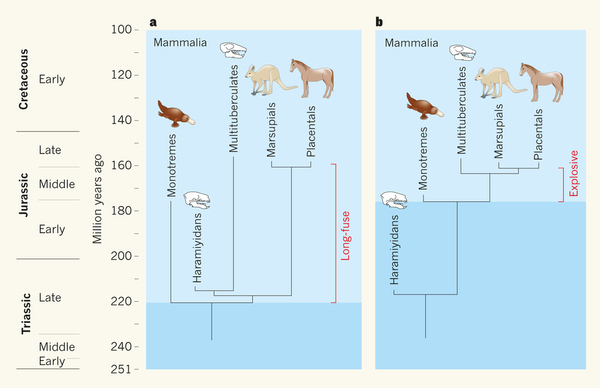 This supports a “long-fuse” model of mammalian evolution: a long delay between the origin of mammals and the diversification (radiation) into their many orders. This interpretation fits best with the molecular evidence. The second fossil, Megaconus,is more complete, and very different morphologically from Arboroharamiya (it was a ground-dweller, rather than arboreal). As described and analyzed by Zhou et al., it is not a mammal . Therefore, it suggests mammals originated in the Jurassic (176-161 million years before present), then immediately diversified. This is a very explosive model of mammalian evolution, and one which many fossil morphologists agree with. So we have two conflicting results based on these two papers*. Does this present an intriguing problem for our understanding of mammalian evolution? Absolutely! We’re going to need even more fossils to resolve this, and continued analyses of these new fossils by other researchers will probably produce even more interpretations. It’s important to note that both fossils were described and published simultaneously, so that (as I understand it) neither research group was able to use the others’ fossil in their analysis. The two haramiyids were different enough from each other that we may actually get a very different model of mammalian evolution with an analysis of the complete data set. I use molecular clocks quite a bit in my own research, and so I’m particularly curious to see if the fossil record will eventually validate the molecular results. I’m going to venture a prediction that it will someday. Let’s keep our fingers crossed that more well-preserved haramiyids are found soon, so we can test this hypothesis! *Oh, and creationists/I.D.-ers? Just because we don’t yet have this resolved yet doesn’t mean it’s unresolvable. Or that evolution didn’t happen. Zheng et al. (2013): “A new arboreal haramiyid shows the diversity of crown mammals in the Jurassic period,” Nature, doi: 10.1038/nature12353. Zhou et al. 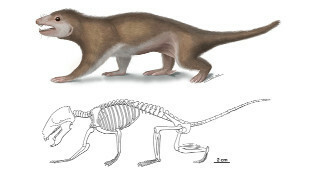 (2013): “A Jurassic mammaliaform and the earliest mammalian evolutionary adaptations,” Nature, doi: 10.1038/nature12429. Next Article Creationism in Texas: good news! Great piece! A shame those findings didn’t come out this time last year for my final year undergrad.